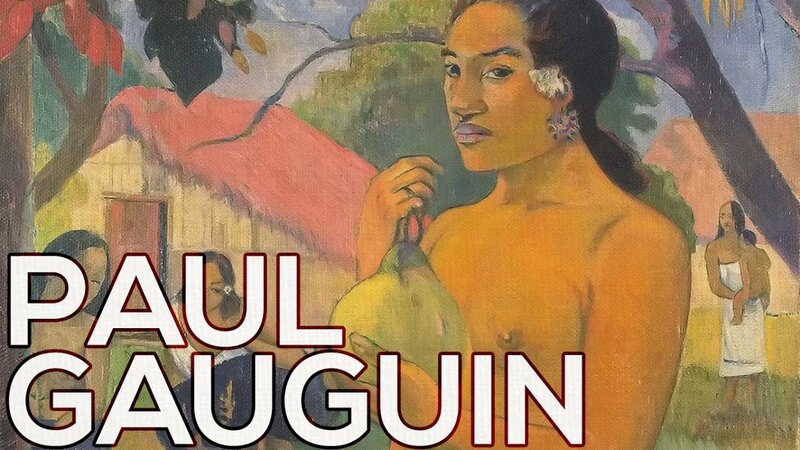 Paul Gauguin was a successful broker in Paris – until the day when he took up painting as a hobby. Then at the age of 35 began a transformation that changed a steady, respected member of society into a character so picturesque, so wild and free, that he became a legend. His art became the only thing that mattered, and for it he gave up wife and family, money, health, friends – all the comforts of a settled existence. Seeking a primitive, unspoiled life where he could live out his life, painting, loving, and free from care, he left for the South Seas. His pictures are regarded as the most thrilling and memorable ever painted. “For I am an artist and you are right, you are not mad. I am a great artist and I know it. It is because I an such that I have endured such sufferings. To do what I have done in any other circumstances would make me out as a ruffian. Which I am no doubt for many people. “Anyhow, what does it matter? What distresses me most is not so much the poverty as the perpetual obstacles to my art, which I cannot practise as I feel ought to be done and I could do it if relieved of the poverty which ties my hands”. The life of Paul Gauguin was so crammed with adventures of all kinds that even a matter-of-fact account cannot decrease its dramatic interest. He was born in Paris in 1848, the year of the second French Revolution; but when reaction took over again a little later, his father, a liberal journalist, had to go into exile. Paul was three years old when his parents took him to Peru, the president of that country being a relative of his mother. The child’s father died on the voyage, and his mother remained in Lima for only four years. Back in France the boy was raised in Orléans until, at seventeen, he went to sea as an apprentice in the merchant marine and sailed back and forth across the Atlantic Ocean between Rio and Le Havre. After the French defeat in 1871, and the death of his mother, he gave up the sea and took a position in a broker’s office in Paris. For eleven years Gauguin followed a successful business career. In 1873 he married a young Danish girl, leading with her and their children a pleasant, comfortable life. Occasionally, on Sundays, he painted as an amateur, though he was ambitious enough to send a landscape to the Salon of 1876. But, unwilling to follow academic precepts, Gauguin soon began to haunt exhibitions and art galleries. His amazing instinct immediately attracted him to the then still scorned and ridiculed works of the Impressionists, whose canvases he not only admired but also bought. It was not long until he became acquainted with Camille Pissarro, always easy to approach and ready to help beginners. Pissarro introduced him to Cézanne and Degas and arranged for Gauguin to show his timidly Impressionist paintings in the exhibitions of their group in 1880, 1881 and 1882. His body and soul now consecrated to painting, Gauguin no longer lived except during his hours of liberty from the office. Relying upon his modest savings and his lucky star, he suddenly decided in 1883 to abandon the bank and take up painting “every day”. He moved with his wife and five children to Rouen, where Pissarro was then working, but soon found living there was too expensive.. Madame Gauguin was able to persuade him that an easier life awaited them in Denmark with her relatives. She hoped above all that the insistence of her family would induce her husband to resume his profitable business career. But the sojourn in Copenhagen turned out to be a complete failure. Gauguin was unsuccessful both as a representative for a commercial firm and as an artist. An exhibition of his work was forced to close after only five days. Discouraged and penniless, Gauguin left his family in Copenhagen and returned to Paris in the summer of 1885. He obtained employment as a billposter in Paris railway stations, but ill health forced him to stop work and spend several weeks in a hospital. Yet no misfortune, no poverty, could induce him to abandon his art. Early in 1886 he moved to the small village of Pont-Aven in Brittany, where he found peace, new subjects, and credit at the inn. When he returned to Paris late that same year, he met Vincent van Gogh who greatly admired him. Overcome by an irresistible desire to escape, Gauguin resolved to leave for Martinique. First he landed in Panama and worked as a common laborer with the diggers of the Panama Canal, to earn his passage to the island. He immediately fell in love with the exotic beauty of Martinique and infused his Impressionist work with some of its tropical colors. But, unable to endure the climate, he obtained passage home as a sailor and late in 1887 returned to France, sick and exhausted. Once more he went to live in Pont-Aven, where he soon met a young friend of Van Gogh’s, Emile Bernard. Under his influence, he now gradually broke away from Impressionism and adopted a bolder style, somewhat inspired by Japanese prints, with radical simplifications of drawing, brilliant, pure, bright colors, an ornamental character of composition, and wilful flatness of planes – a style which he called Synthetism. At the insistence of Vincent van Gogh, and with the financial help of Vincent’s brother Theo, Gauguin left Pont-Aven in the fall of 1888 to join Van Gogh in Arles. But their divergent temperaments and opinions soon caused the two friends to quarrel violently. Van Gogh suffered a nervous breakdown, followed by an attack of insanity during which he threatened Gauguin’s life. After Van Gogh had been taken in a serious condition to the public hospital in Arles, Gauguin left hurriedly for Paris, and then again for Brittany. Gauguin’s new style attracted the attention of several young painters in Pont-Aven and he slowly gathered a small group of followers around him. Yet this modest success was not accompanied by any material benefits. The dreariness of his situation once more stirred in Gauguin the irresistible desire to seek out faraway lands, despite the failure of his trip to Martinique. At the end of 1890, he went back to Paris to prepare for a yoyage to Tahiti, dreaming of life under palm trees and a tropical sun. Living in the jungle of Tahiti, Gauguin set out to work feverishly, his imagination tremendously stimulated by his lovely and peaceful surroundings. His will to simplfy forms as well as his arbitrary use of colors, combined with his literary aspirations, gave his work its decorative stamp. Thus the novelty of Gauguin’s art consisted not only in his subjects, but also in his conception of these subjects, in his efforts to reconcile the barbarous character of Maori idols with the sensitivity of a European artist. After the first few months in Tahiti, Gauguin’s enthusiasm was once more supplanted by bitter resignation; hunger and poverty again became his daily guests. He fell ill and spat alarming quantities of blood. Finally, in desperation, he begged to be taken home. The French government repatriated him in the summer of 1893. In Paris unexpected news awaited him: an uncle in Orléans had left him a small legacy, and Gauguin was able to spend money liberally, if only for a short while. He had a comprehensive exhibition which met with little success, rented a large studio where he lived with an Indonesian girl, gave receptions, and undertook some short trips, including one to Copenhagen. He spent the summer of 1884 once more in Pont-Aven, accompanied by his young mistress. Some slighting remarks addressed to the strange couple involved him in a brawl with several sailors during which his ankle was broken. During his sleepless nights Gauguin now again abandoned himself to his favourite dream: life in the tropics. In spite of his harassing experiences, of hunger and illness suffered in the South Seas, he decided to return there, this time forever. Disposing of everything he owned at public auction (though he had to buy back most of his pictures so as not to let them go for ridiculous prices), Gauguin got ready to leave in the spring of 1895. The fate that awaited him in Tahiti was no more pleasant than the one he had met there before. He worked only between trips to the hospital, accumulated debts, was grief-stricken at the news of the death of his favourite child. Eventually in 1898 he went to hide himself in the mountains and attempted suicide, but unsuccessfully; even death did not want him. Meanwhile in Paris, the dealer Ambroise Vollard began to take some interest in Gauguin’s work, exhibited his paintings and offered him a contract which guaranteed him at least the bare essentials of his frugal life. But now the painter began to quarrel with the colonial administration until, after several more sojourns at the hospital, he sold his belongings in 1901 and left Tahiti for the nearby island of Hiva-Hoa. Gauguin began to think of returning to France when his health improved and he was able to paint more frequently. However, he still suffered from heart trouble and from eczema of his injured foot. Whenever he could not paint, he wrote his memoirs as well as acid letters to various local officials, one of whom brought suit against him. In January 1903, a cyclone destroyed his hut; in March he was condemned to several weeks in prison and found himself without means to go to Tahiti for an appeal. Yet no appeal was necessary. The threat of imprisonment released him to death. Paul Gauguin died on May 8th 1903, lonely and heartbroken, far from his country, his family, his friends. But ever since, his paintings have asserted his powerful presence throughout the civilized world.